Microbes have a remarkable ability to adapt to the extreme conditions in fracking wells, according to a study published in the October issue of Nature Microbiology. 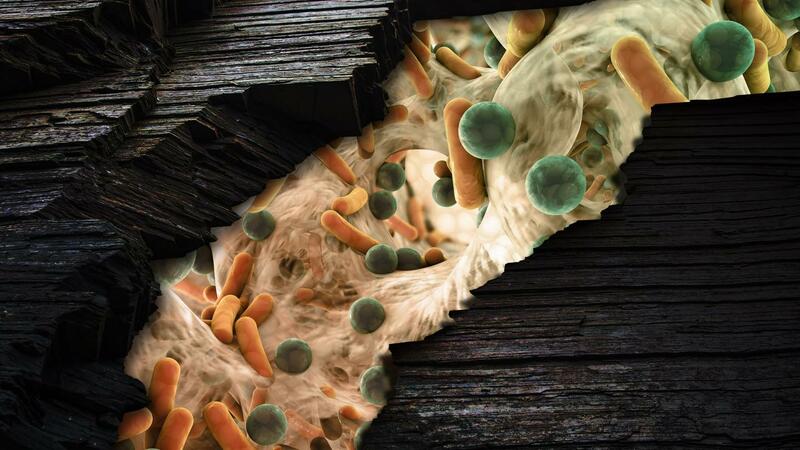 Scientists led by researchers at Ohio State University found that microbes actually consume some of the chemical ingredients commonly used in the fracking process, creating new compounds which in turn support microbial communities below ground. The process allows the microbes to survive in very harsh environments that include very high temperatures, pressures, and salinity. The work, based on samples from hydraulically fractured wells in Pennsylvania and Ohio, helps scientists understand the complex interactions among microbes — important for understanding the planet's environment and subsurface. The findings also help scientists understand what is happening in fracking wells and could offer insight into processes such as corrosion. David Hoyt, a scientist within the Environmental Molecular Sciences Laboratory (EMSL) at the Department of Energy's Pacific Northwest National Laboratory, was part of the team that ferreted out the geochemical indicators of microbial activity. The team studied microbes in fracking fluid from more than a mile and a half below the ground surface. Researchers measured the metabolic byproducts excreted by the microbes, which can tell scientists what compounds the microbes are producing, where they are drawing energy from, and what they need to stay alive. The sampling of a microbial community's byproducts or metabolites gives insight into the community the same way a blood test yields information about a person's health, eating habits, and lifestyle. "A thorough look at the metabolites of a community allows us to detect what chemical changes are occurring over time, how they support microbial life in the deep subsurface and what are the common biochemical strategies for these microbes that prevail across different shale formations," said Hoyt, a biochemist. Using multiple samples drawn from the two wells over a 10-month period, the team identified 31 different microbes in fluids produced from hydraulically fractured shales. The team found that fractured shales contained similar microbial communities even though they came from wells hundreds of miles apart in different kinds of shale formations. The complex mix – with some microbes producing compounds that others use or feed upon – produces some interesting outcomes. One particularly interesting compound, glycine betaine, is what allows the microbes to thrive by protecting them against the high salinity found in the wells. Other microbes can subsequently degrade the compound to generate more food for the bacteria that produce methane. Yet another process may produce substances that contribute to the corrosion of the steel infrastructure in wells. The scientists even discovered a new strain of bacteria inside the wells which it dubbed "Frackibacter." The scientists say more work is needed to understand the implications of the study. Microbial action is central to how much carbon enters Earth's atmosphere and for understanding how chemicals in the ground change and move. Studies like this one that contribute new information about microbial communities could have implications beyond fracking. "The study highlights the resilience of microbial life to adapt to and colonize a habitat structured by physical and chemical features very different from their origin," said corresponding author Kelly Wrighton, assistant professor of microbiology and biophysics at Ohio State. To do the study, researchers drew upon resources at two DOE Office of Science User Facilities. At EMSL, Hoyt used nuclear magnetic resonance instruments to analyze the metabolic byproducts of the microbes. Resources at the Joint Genome Institute at Lawrence Berkeley National Laboratory helped researchers unravel the genetic sequences of microorganisms within the communities. The work was funded primarily by the National Science Foundation, with additional support from the DOE Office of Science and the Alfred P. Sloan Foundation. Rebecca A. Daly, Mikayla A. Borton, Michael J. Wilkins, David W. Hoyt, Duncan J. Kountz, Richard A. Wolfe, Susan A. Welch, Daniel N. Marcus, Ryan V. Trexler, Jean D. MacRae, Joseph A. Krzycki, David R. Cole, Paula J. Mouser and Kelly C. Wrighton, Microbial metabolisms in a 2.5-km-deep ecosystem created by hydraulic fracturing in shales, Nature Microbiology, Sept. 5, 2016, http://dx.doi.org/10.1038/NMICROBIOL.2016.146.